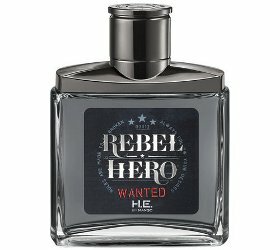 Spanish fashion brand Mango has launched Rebel Hero Wanted, a new fragrance for their masculine H.E. by Mango line. Rebel Hero Wanted is a flanker to last year's Rebel Hero. The notes feature grapefruit, apple, amber, praline, leather accord, patchouli and cedar. Mango Rebel Hero Wanted is available in 100 ml Eau de Toilette, and can be found now at Sephora in France.